For campers and their parents, certification offers you a guarantee of the services you can expect and it serves as a precious tool in the management of the safety and the quality of its activities. 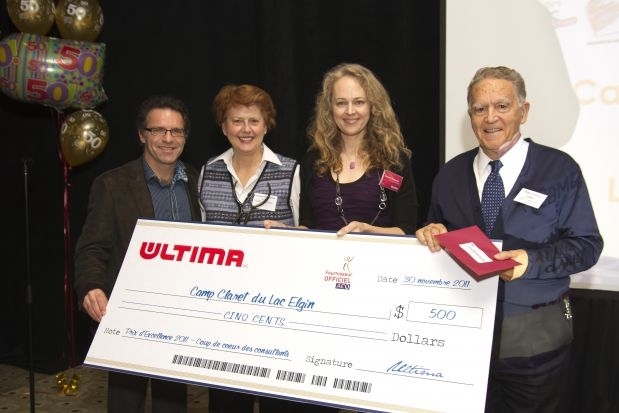 Since 1961, the Quebec Camping Association has developed substantial expertise regarding camps for children. 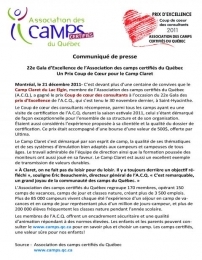 It is THE reference source for everything affecting Quebec camps, and has acquired considerable credibility among the various parties concerned with recreation, health, education, the family and the media. In Quebec, more than 150 camps follow the high standards of quality of QCA. Camp Claret, founded in 1964, was one of the first camps to be recognized when the accreditation program began in 1967. Since then, every 3 years, the overseers for certification recognize as praiseworthy the conformity of Camp Claret with the high standards of its program relative to security, ratio of campers to adults, well-trained staff, quality of the outdoor education with multiple activities offered, as well as a hearty balanced diet and a much-valued evening program. 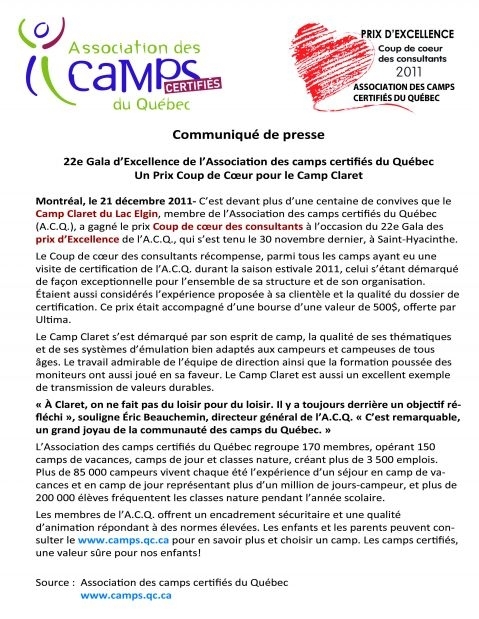 Camp Claret is a leader in the Quebec Camping Association Community! In 2011, the ACQ recognized the exceptional contribution of Camp Claret in the field of camping and outdoor education for children! This fact was highlighted in the certification report written up by Mr. Eric Beauchemin, Director General of the Quebec Camping Association. At each camp session offered to the campers during the summer, a wonderful activity program awaits them along with inspiring evening programs staged and adapted to each age groups all of which have been prepared during the year and approved by the Associate Director. 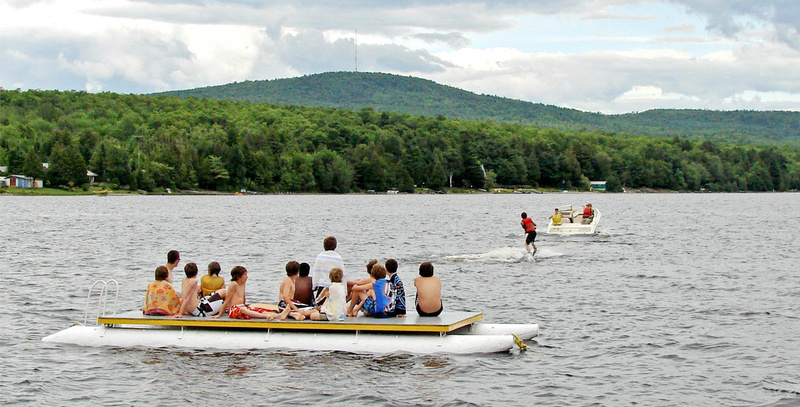 Camp Claret is a traditional summer camp where values are at the core of their outdoor education program. Training of the counsellors is pivotal to ensuring the quality. All aspects of camp life are covered. Everyone understands well their role and mission at Camp Claret. Many counsellors return several consecutive years, therefore a strong sense of belonging and pride is created. It is a family! Of course, the Directors are actively involved in all aspects of camp life for over 50 years now. Because of their work ethics, their creative approach and their commitment to reach excellence. 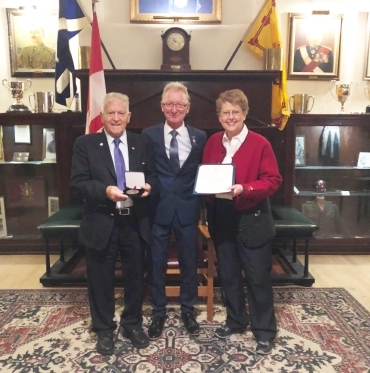 This medal recognizes Father Carmel's 55 years and Ms Pauline Rondeau's 51 years of involvement in the field of outdoor education as Directors at camp Claret dedicate to shape and help today's youth find the inspiration and character needed to become tomorrow's leaders. 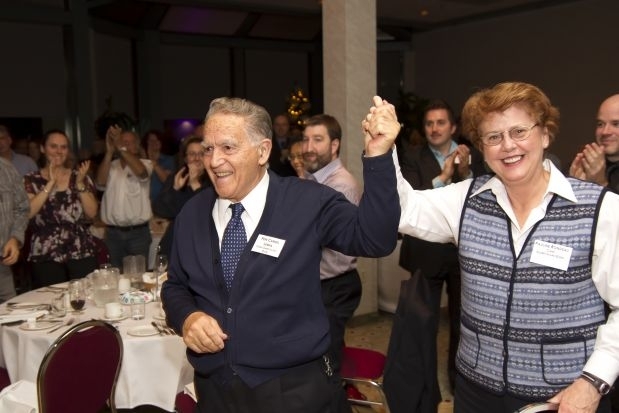 At the Quebec Camping Association’s annual Congress held in Ste-Adèle on November 15th 2017, Ms Pauline Rondeau received the “Torchbearer’s Award”. 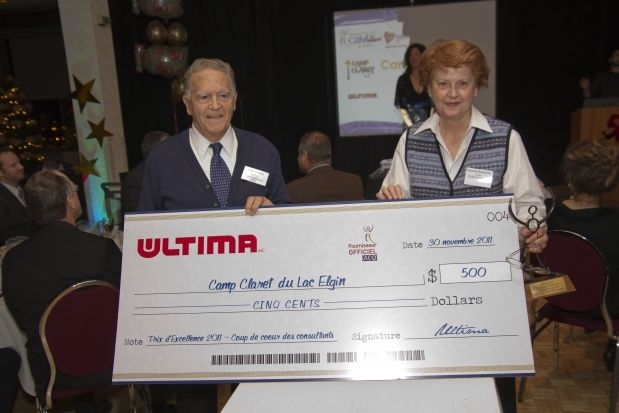 It was in 1968, 4 years after the founding of Camp Claret by Father Carmel, that Ms Rondeau joined the team. Together they created a unique living environment with the education of youth as their top priority and mission. 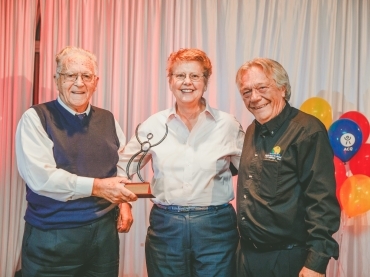 The Torchbearer’s Award highlights her 50 years of involvement and excellence in Camp Claret. It is because of her outstanding contribution that Camp Claret has become what it is today. 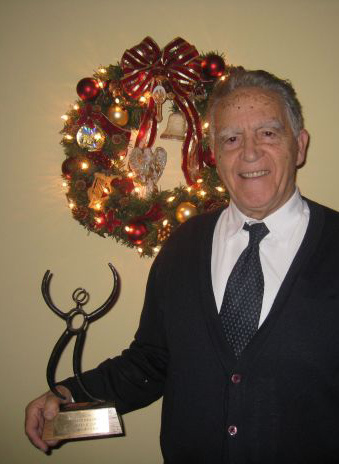 Founder of Camp Claret in 1964, Father Carmel can certainly be proud of his accomplishment. 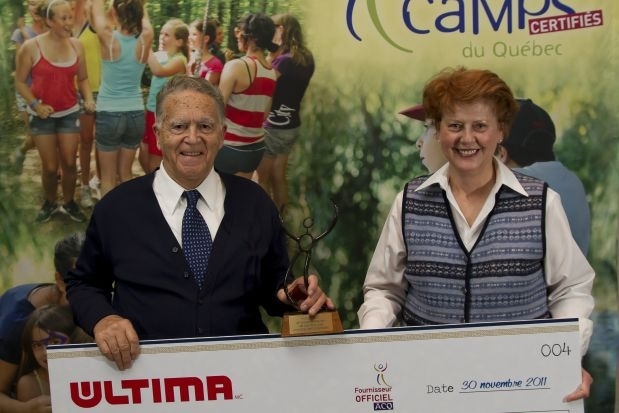 It is with gratitude that the Quebec Camping Association chose to honor Father Carmel by naming him as honorary co-president of the 2008 World Conference held in Quebec City. 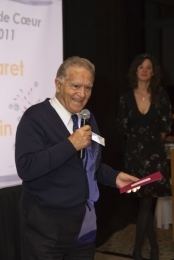 On this occasion, at the international dinner, he was awarded the 1st Award of Excellence of the QCA to highlight his passion for camping for the past 45 years and his quest for excellence and dedication to the education of the youth. Father Carmel has always been very active in the development and life of the Quebec Camping Association and he is an inspiration for many of its members. The Canadian Camping Association is a National Non-profit Federation of provincial camping associations that has as a Mission to be dedicated to the growth, development and promotion of organized camping for all populations in Canada.